“Anonymity breeds meanness – the internet has proven this time and time again” (Altman, 2014). Traditionally, if children were bullied in the playground they would be able to identify the attackers from their faces. More recently, if children were bullied on Facebook or Twitter they would often be able to identify the attackers from their usernames. But now, if children are bullied on anonymous social networking sites and apps they often have no way of knowing who is behind the cruel and hurtful comments. The list of anonymous social networking sites and apps is continuing to grow, however three currently popular ones are described below, in an effort to keep parents in the loop about the activity your teenagers may be encountering online. Yik Yak allows users, or Yakkers, to write posts anonymously, which are then shared with other users who are located nearby. This is determined by the GPS location data on each smart device. However, the app has also been used for sharing sexually explicit content and posting abusive and personal attacks on other users. TechCrunch writer, Sarah Perez, has outlined some examples. These include posts that saw some students bullying a girl for getting raped, a teenager arrested after threatening to shoot someone and anonymous bomb threats which saw schools going into lockdown. Since these unfortunate incidents began making news headlines, the app founders have increased the age rating of the app to 17 . 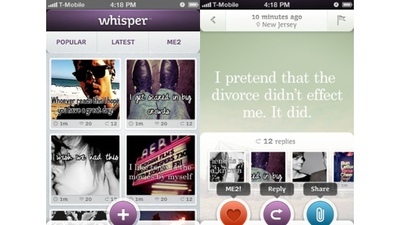 Whisper allows users to share thoughts, emotions and confessions with the world, using a selection of photos and fonts. These posts are then visible in a real-time stream for others to see. Other users can respond to your Whispers with anonymous comments. Whisper has become very popular with teenagers. Yet despite these good intentions, Whisper has been used in harmful ways. For instance, predators have been known to use Whisper to contact victims, can reveal a user’s location through their phone’s GPS data and also be used to cyberbully peers, or spread rumours about schools and teachers (Younger, 2013). Whisper is rated 17 by the App store. Secret allows users to post secret thoughts, emotions and confessions, and share them with friends from their mobile phonebook. Users will not know who posted what content, only that it was one of their friends. Posts spread when a user “likes” them, as this makes that post visible to all their friends, and so on. In other words, messages appear only as from “friend” or “friend of friend.” Secret is not the best app for cyberbullies to use, as users cannot message other users directly, and there is no way of knowing that a target has even seen a mean post written about, or for them. However, that has not stopped malicious rumours and gossip from spreading across the app. This has led to the founders asserting that they will work on ways to deter slanderous or abusive posts. It is important to remember that these anonymous social networking apps do not cause cyberbullying. People cause bullying. Many of these apps can be fun, engaging and a forum for creative outlet. As a parent, you need to keep on top of the trends and risks associated with such activity and ultimately make the educated decision as to whether you are comfortable with your children using these apps. Perez, Sarah (2014). Amid Bullying & Threats of Violence, Anonymous App Yik Yak Shuts Off Access to U.S. Middle & High School Students. Younger, S. (2013). What parents need to know about the Whisper app.